If your idea of an unforgettable vacation includes igloos, yak hair tents or underground cave dwellings, you may want to consider reserving a room at one of these extreme hotels from around the world. If your idea of an unforgettable vacation includes igloos, yak hair tents or underground cave dwellings, you may want to consider reserving a room at one of these extreme hotels from around the world. Located in one-of-a-kind destinations from the Arctic Circle to a remote Patagonian rainforest, these adventurous accommodations offer unbelievable perks -- stunning Northern Lights views, sea kayaking and thermal baths, to name a few. However, while some of these lodgings may take you to the edges of the Earth, all offer comfortable living quarters and top-flight amenities that make guests feel right at home. Located outside the monastic village of Labrang at an altitude of 10,000 feet, Norden Camp introduces travelers to the nomadic way of life. This unique outpost was founded in a destination where itinerant herders graze their animals in the winter and fields are filled with flowers throughout the summer. Facilities are simple, with a dining area, fire pit and sauna, and accommodations include four traditional yak hair tents along with eight log cabins. Both types are portable; all have wooden floors and are furnished with local antiques and wood furnaces. The camp practices ecological and cultural responsibility, and activities vary from stargazing and hiking to visiting the Labrang Monastery and shopping at the local Norlha textile workshop. In Chile's remote Patagonian rainforest, Huilo Huilo -- a UNESCO Biosphere Reserve -- practices sustainable conservation through community development programs and tourism. Among the accommodations for adventurous travelers are a lodge shaped like a mushroom, rustic cabins, a tree house "village" and La Montaña Mágica Lodge. This volcano-shaped hotel features water cascading down its sides rather than lava. Visitors can choose standard rooms or suites (on the ground level), all built by local craftsmen, with walls, floors and ceilings made of native wood. Naturally heated bathtubs are crafted from ancient tree trunks, and rates include a welcome drink and buffet breakfast. Along with luxuries like a spa and artisanal brewery, the vast property offers a wealth of activities, from trekking to mountain biking to the thermal baths of Pirihueico Lake. Eco-adventure meets urbane luxury at this architecturally stunning resort. The main building sits atop two extinct volcano craters with guest rooms built along the slopes. Some suites come with private plunge pools, and all accommodations have shower areas with sweeping Pacific Ocean views. Equally dramatic vistas can also be enjoyed from Evolution Restaurant, DNA Bar and Homo Sapiens Explorers Lounge with a library dedicated to science and the Galapagos. The infinity pool and Sumaq Spa embrace guests with a sense of tranquility, and two yachts are available for day trips. The entirety of the Galapagos and the surrounding marine reserve are a UNESCO Natural World Heritage Site, and several excursions include snorkeling, mountain biking and sea kayaking -- all with an emphasis on sustainable tourism. Being one with the Earth takes on new meaning at Kokopelli's Cave. Originally intended as a geological research office, this manmade one-bedroom B&B sits 70 feet below the surface of a mesa and is accessed through an entrance carved into a cliff face. Complete with a working kiva fireplace, this rustic retreat is reminiscent of the nearby Anasazi cliff dwellings -- with the exception of electricity, comfy Southwest furnishings and a rock-walled bathroom with a hot tub and waterfall shower. Along with a full kitchen, a patio barbecue is on hand for outdoor grilling. Of note is the breathtaking sunset view spanning across La Plata River Valley and the four states region of Arizona, New Mexico, Utah and Colorado. 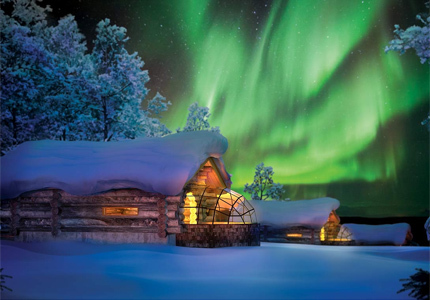 Next to Urho Kekkonen National Park in Lapland, 155 miles north of the Arctic Circle, this resort features a variety of lodgings -- including gorgeous glass igloos. Built of thermal glass and designed to stay frost-free, these unique guest rooms offer the opportunity to watch the Northern Lights from the toasty comfort of your own bed. You can also stay in classic snow igloos, log cabins or log cabin/glass igloo hybrids. The resort is home to the largest smoke sauna in the world, and dining venues include a picturesque log restaurant with a menu that showcases Lappish specialties. To round out your unforgettable experience, you can embark on a gold panning excursion or try the reindeer-drawn sled safari.